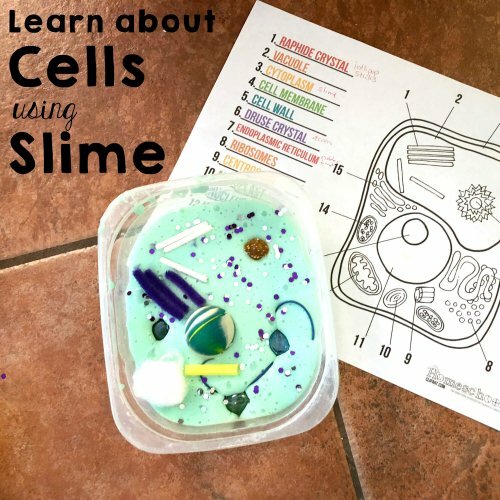 My kids weren’t really interested in learning about cells until I said slime. Okay, it was a fairly cheap trick since I knew they loved slime. 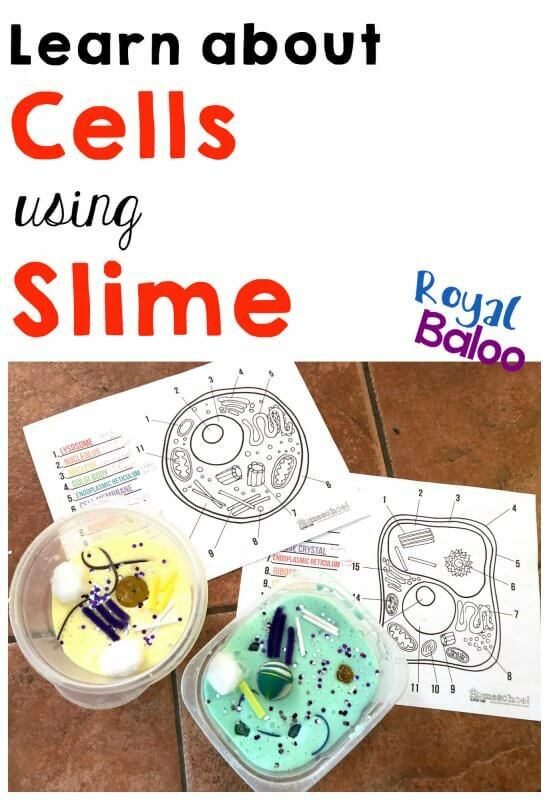 But I also knew that slime would be the perfect way to learn about cells. I can’t say I’ve ever touched cytoplasm but it sounds very slime-like to me. It’s a biology year at our house which means we will be studying animals, the human body, and then plants. Naturally, it all started with a discussion on what does it mean to be alive (from a scientific viewpoint, not philosophical). Next, we covered cells, briefly. I didn’t want to get into every single thing but I did want them to see how similar plant and human cells are and how many similarities we share as living beings. 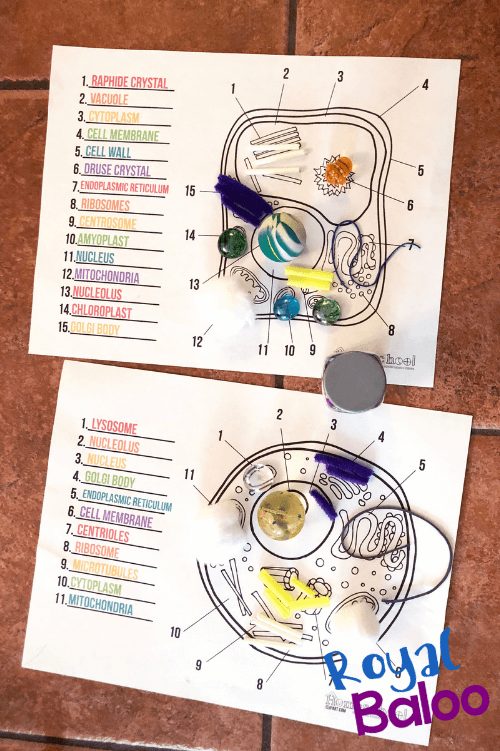 Although, I would have loved to take more time to discuss what each part of the cell does. 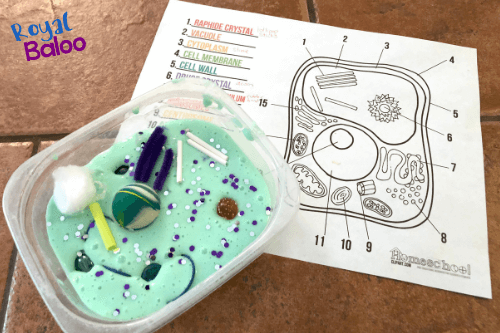 First, you’ll need an animal cell model and a plant cell model. You can use one from a book or print one off online. Next, make your slime. 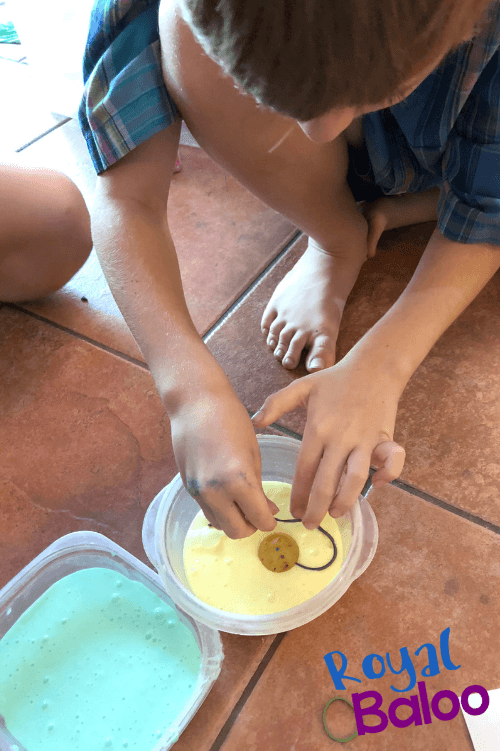 There are so many ways to make slime. We used the contact lens solution method simply because those were the materials we had. 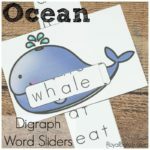 Any of the methods should work for this activity. Use whatever you happen to have on hand! We made two batches – one green and one yellow. Plant cells are green because of the chlorophyll so we made sure to make it green. 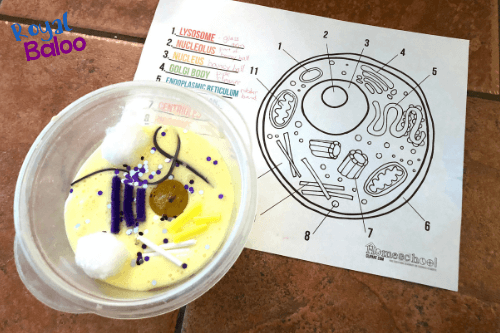 Also, make sure to use a roundish bowl for the animal cell and a rectangular container for the plant cell. Plant cells have fairly rigid cell membranes that keep their shape. Animal cells don’t. After you’ve made the slime, start your scavenger hunt for the rest of the materials. 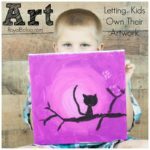 I will share what items we used. 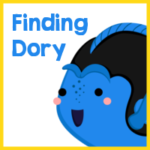 But I definitely recommend letting your kids find the items themselves! Part of the process is observing the parts and determining what you have in your house to represent them. I am all about hands-on activities as much as possible. 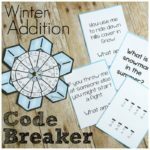 Activities keep them engaged in a way worksheets and books just don’t. But I wanted to do the cell models for two other reasons. 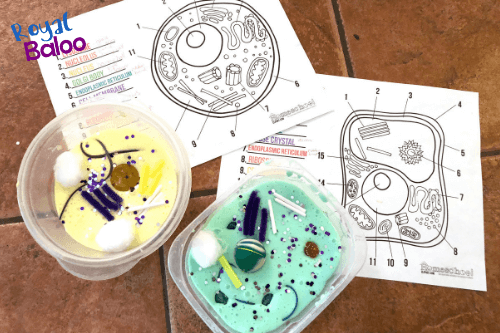 First, the slime model would bring the idea of a cell and cell parts to life for them. Most cells are too small to see by the human eye. We looked at a chicken egg up close but I could tell they didn’t really see it. The slime cells were large and it was easy to see all the different parts. Second, I knew that by having a scavenger hunt to find something for every part, they’d be an active part of the activity. Not only would they have to consider each part but they would have to look at the details. To find the Druse Crystal they needed to look at its size, general shape, and decide if it should be a certain color. As an added bonus, there was a lot of discussions in which they were repeating the cell parts over and over. The process of finding something around the house for each item got them so involved and attentive to each part. 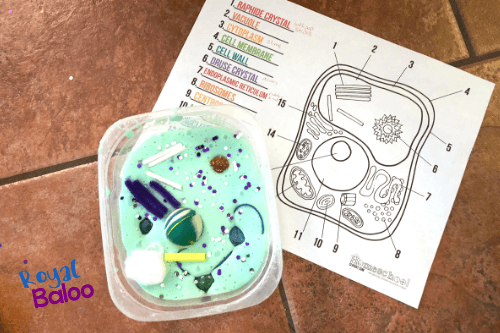 Enjoy your studies of biology with this hands -on slime activity!